Life Insurance services are provided by Experien Insurance Services Pty Ltd ABN 99 128 678 937. Experien Insurance Services Pty Ltd is a Corporate Authorised Representative (No. 320626) of ClearView Financial Advice Pty Ltd Limited ABN 89 133 593 012 AFS Licence No. 331367. General Insurance services are provided by Experien General Insurance Services (EGIS)Pty Ltd trading as Experien Insurance Services ABN 77 151 269 279 AFS Licence No. 430190. Information shown here is for personal use and guidance only and does not constitute any contractual representation or warranty. 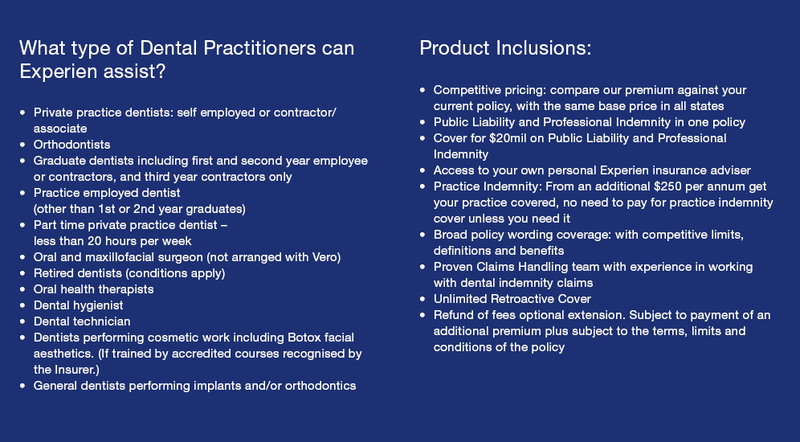 Experien General Insurance Services Pty Ltd (ABN 77 151 269 279) AFSL 430190 arranges the Dental Professional Indemnity insurance as a Broker. AAI Limited ABN 48 005 297 807 trading as Vero Insurance issues the insurance for policies renewing up to 1 May 2019. 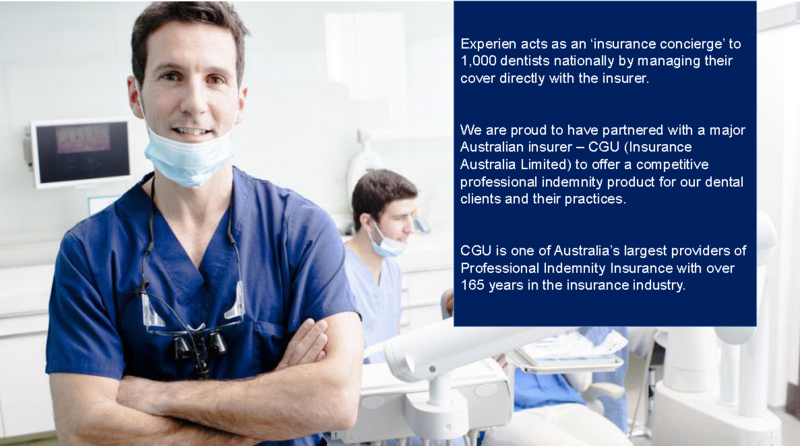 Insurance Australia Limited ABN 11 000 016 722 AFSL 227681 trading as CGU Insurance is the insurer for new policies from 1 May 2019 and renewing policies from 1 May 2020. In effecting this contract of insurance the Broker will be acting under an authority given to it by the Insurer and the broker will be effecting the contract as agent of the Insurer and not the Insured.